The diversity of students at Tech leaves no shortage of opportunities to connect with people of different cultures, religions and backgrounds. One lesser-known forum for cross-cultural interaction is the Friends Beyond Borders Cafe at the Language Institute. The Friends Beyond Borders Cafe is held every Friday from 12pm to 2pm in the Language Institute Building on Sixth Street. Light refreshments are served, and students have the chance to expose themselves to new languages. The weekly event allows the international students at The Language Institute to practice their English with fluent English students at Tech, and English speakers to practice foreign languages they are learning. Every Friday afternoon, students at the Language Institute gather for snacks and to exchange language communication skills. Tech students who are native or fluent English speakers are welcome to go and chat with people from many different countries. It is an open, walk-in environment that allows casual conversation and an enjoyable atmosphere for anyone looking to enhance their language skills with others. The main languages represented are Korean, Arabic, French, Spanish, Japanese and Chinese. Eman Alhajji is a high-school graduate from Saudi Arabia who came to the Language Institute as part of a scholarship program that will soon lead to her pursuing an undergraduate education, hopefully in Physics, at an American college. “We have to spend time speaking with different people to get more knowledge about their native culture,” said Alhajji. Livia Prasinos is a student from Brazil who has been in America for a month since graduating high school in Brazil. “I learned about this from a friend. I love meeting new people and getting to know different cultures,” Prasinos said. Jenny Lee is a current student at the Institute from South Korea who finished her undergraduate education there in IE. “I want to see more American students at the Cafe,” Lee said. “If American people practice other languages, we can help each other and our thinking becomes more broad,” Lee said. Lee explained that she would like to see more English speakers coming to these events, to avoid students of the same country only talking to each other. 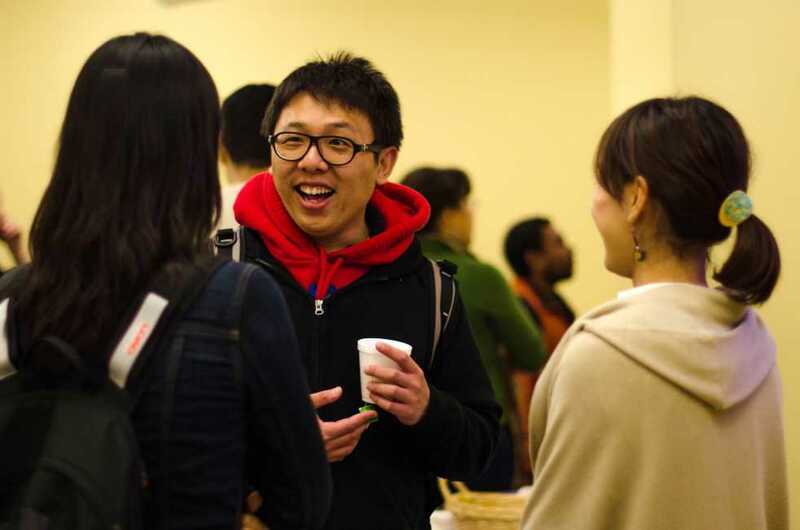 A few Tech students wanting to share and expand their language skills come frequently to the cafe, and bring their friends to the event as well. Jon Sylvester, a fourth-year student, came last Friday to the cafe for the first time, after hearing about it from his friend who comes almost every week. “I travelled to Mexico and I know it’s tough to meet people, they have their own groups. I like to speak Spanish to practice and make effort to meet people,” Sylvester said. The Language Institute also offers a Conversation Partner Program, which is an online chat-room forum that pairs up Tech students, faculty and alumni from different cultural backgrounds to get to know each other and their cultures in a personal, one-on-one environment.